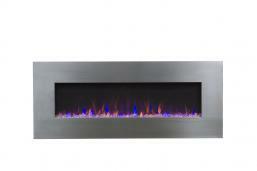 Our latest addition to the Onyx family of wall-hanging fireplaces is the Onyx Stainless 50 inch. 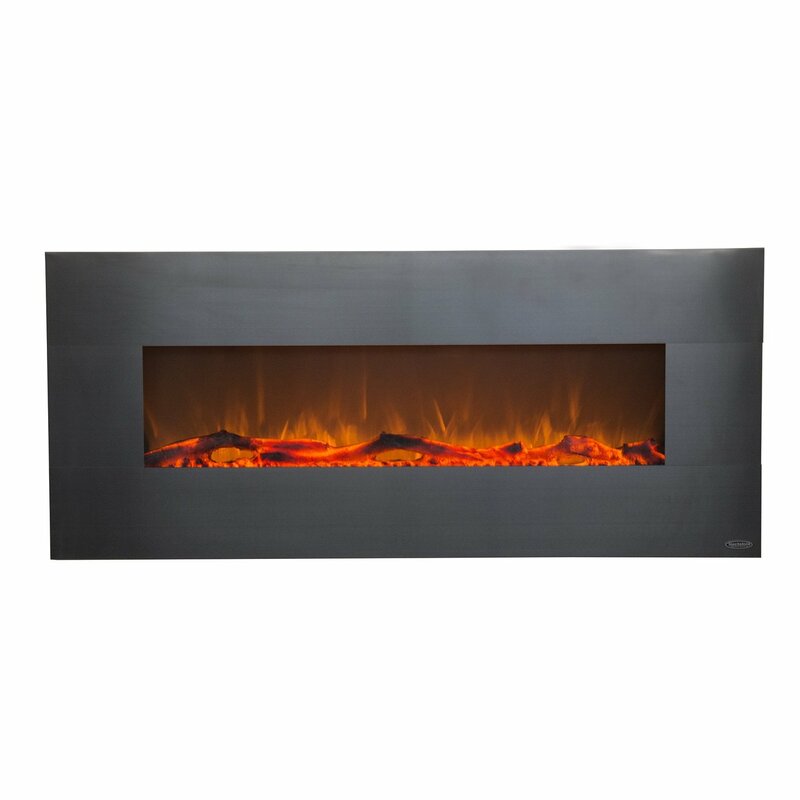 The stainless version has all the great features of the standard Onyx, like log and crystal choice, realistic flames, 2 heat settings and simple installation. But, the stainless steel face makes the fireplace a great fit for kitchens and modern interiors. Stainless face in our most popular fireplace mode. Now with a log-set flame and crystal flame included. Your choice! With its life-like flames and stunning stainless metal frame, Touchstone's Stainless Onyx® is ideal for installations in kitchens with stainless appliances or more modern decors. This 50" wide electric fireplace can be mounted on the wall of your bedroom, family room, or anywhere in your home to offer the aesthetic appeal of a finely crafted fireplace without the troubles or hazards of an actual fire. While the Stainless Onyx® can be used without the heating feature for simple mood or stylistic purposes, it also offers 2 levels of heating (high and low) to help heat any room up to 400 square feet. Additionally, the Touchstone™ Stainless Onyx® Electric Fireplace requires a simple installation with easy step by step instructions. 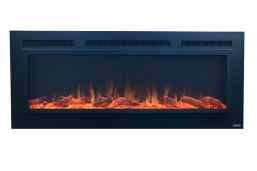 The Stainless Onyx® now ships with both a log and crystal hearth option. When you receive the Onyx®, just choose if you want the realism of a log flameset or the modern look of a crystal flameset. To view the realistic flames of this unit check out the video link on this page. The Stainless Onyx's flames sit behind one tempered piece of glass and offer the illusion of a real fireplace without the hassle. The Stainless Stainless Onyx's heating options make this electric fireplace a versatile addition to your home. Thanks to the Stainless Onyx's ability to display flames while emitting heat or to display flames without the heating feature, you can also enjoy the calming flames all year round. In addition to its versatile heating settings, the Stainless Onyx® also offers 5 flame brightness settings giving you the ability to adjust the flames to your desired glow. The brightness options, which can be manipulated by the unit's remote, range from a dull ember glow to a full blaze. 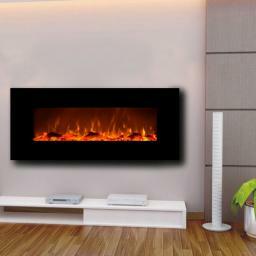 The Stainless Onyx's flames are so realistic, your electric fireplace will be mistaken for a real gas fire place. Offering both a high and low heat setting, which quickly add heat to a room up to 400 sq. ft. Please note the heater isn't designed to be the primary heat source in your room or home. Its designed to warm up a cool evening, or bring the temperature of a room up a few degrees. You will find that the heat and style of your electric fireplace combined with your home's primary heating will offer just the right amount of warmth and ambiance for a cozy atmosphere. You can control your electric fireplaces heat setting by using the units remote control or by simple using the control options on the side of the fireplace. The Stainless Onyx® also gives you the option of using the built in timer to control the heat settings so that you have the ability to time the fireplaces heat duration for up to 7.5 hours. Mounting your Stainless Onyx® fireplace to your wall is simple and it usually only takes one person to get the job done. Installation instructions are included with the unit and are clear and easy to understand. The Stainless Onyxs easily mountable bracket is included and once it has been mounted to your wall, all you need to do is hang and secure your fireplace with the included screws. As recommended by Touchstone™, the optimal placement of your Stainless Onyx® Electric fireplace is high enough on your wall to conceal the mounting hardware but at least 24 inches below your ceiling. Most customers opt to mount their Stainless Onyx® on the wall below their wall-mounted flatscreen television, however, we recommend you mount your electric fireplace at least 24 "below your TV because of its heating feature.